What's new in Unicode 6.3 ? These five characters are being encoded as part of a significant revision of the Unicode Bidirectional Algorithm to allow the implementation of isolate runs (draft here). What else can we say about Unicode 6.3 ? The UTC is still tweaking Cuneiform numeric properties, this time changing the numeric values of U+12456 ⑖ (CUNEIFORM NUMERIC SIGN NIGIDAMIN) and U+12457 ⑗ (CUNEIFORM NUMERIC SIGN NIGIDAESH) from "-1" to "2" and "3" respectively. Two misnamed Cuneiform characters, U+122D4 ⋔ (CUNEIFORM SIGN SHIR TENU) and U+122D5 ⋕ (CUNEIFORM SIGN SHIR OVER SHIR BUR OVER BUR), will also be given the formal aliases of "CUNEIFORM SIGN NU11 TENU" and "CUNEIFORM SIGN NU11 OVER NU11 BUR OVER BUR" respectively (implementations may use these aliases instead of the incorrect but immutable formal character names). Standardized Variation Sequences, defined using Variation Selectors 1 through 16 (U+FE00..U+FE0F). These are defined by the Unicode Technical Committee, and new standardized variation sequences are synchronized with releases of versions of the Unicode Standard. Ideographic Variation Sequences, defined using Variation Selectors 17 through 256 (U+E0100..U+E01EF). These are registered in the Ideographic Variation Database (IVD) by organizations or individuals. The IVD is maintained by the Unicode Technical Committee, but updates to the IVD are not synchronized with releases of versions of the Unicode Standard. 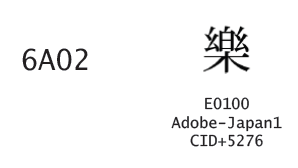 The Unicode Standard 6.3 will define the visual appearance of standardized variants for CJK unified ideographs as being the same as the corresponding CJK compatibility ideograph in the Unicode code charts (and presumably where the charts give different national or regional glyph forms for the same compatibility ideograph, as in the case of U+F907, the glyph form of the variation sequence will not be fixed but will depend upon the national or regional context in which it is used). However, the great majority of CJK compatibility ideographs represent pronunciation variants (i.e. where a single character has multiple readings, and in some pre-Unicode national standard the different readings of the same character were assigned different code points). 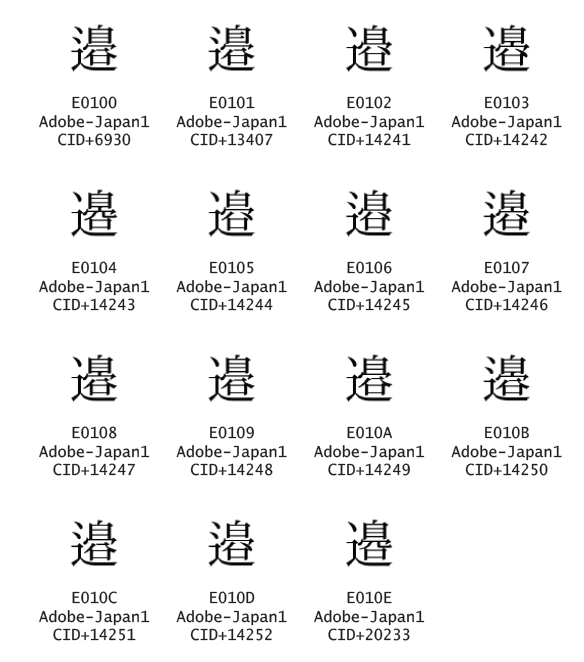 Therefore, in most cases the glyph form of a CJK compatibility ideograph is identical to the national or regional glyph form of the corresponding unified ideograph, with the result that a large proportion of the 1,002 standardized variants for CJK unified ideographs defined in Unicode version 6.3 do not define any meaningful difference in visual appearance from the base character by itself. As an example, there are three Korean pronunciation variants of the character U+6A02 樂 encoded as compatibility ideographs: U+F914 (K0-5162), U+F95C (K0-5525) and U+F9BF (K0-6879). These will correspond to the standardized variation sequences <6A02, FE00>, <6A02, FE01> and <6A02, FE02> respectively, but all three variation sequences have the same glyph appearance as each other and the same glyph appearance as the Chinese, Japanese, Korean and Vietnamese glyph forms for U+6A02 in the Unicode code charts. 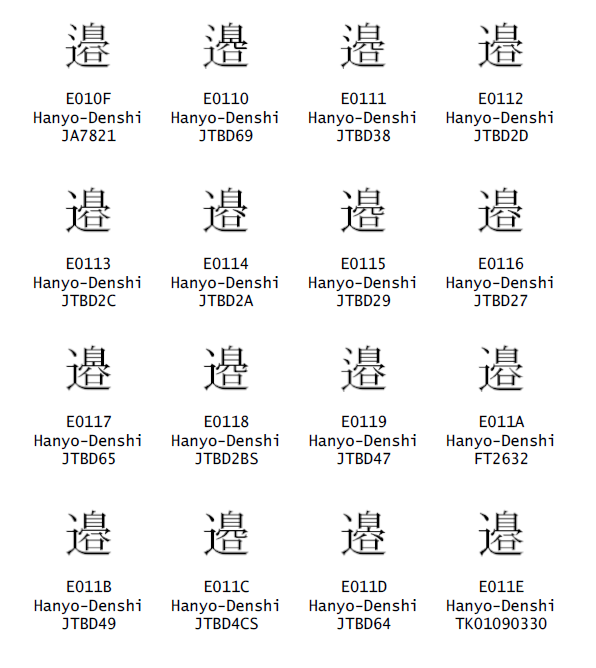 Furthermore, the registered ideographic variation sequences <6A02 E0100> (Adobe-Japan1 CID+5276) and <6A02 E0101> (Hanyo-Denshi JA6059) share exactly the same glyph form. Thus, the variation sequences <6A02, FE00>, <6A02, FE01>, <6A02, FE02> <6A02 E0100> and <6A02 E0101> are all visually indistinguishable, and except in Taiwan and Hong Kong they are essentially identical to U+6A02 by itself. This is the first time that standardized variation sequences have been defined for character variants that are not visual variants, and perhaps opens the door to using standardized variation sequences to define semantic or phonetic variants of characters from other scripts (which would be a bad thing, in my opinion). The Chinese art and antiquities market is huge, feeding the insatiable appetite of tens of millions of middle class collectors as well as the growing class of entrepreneurs and nouveaux riches looking for ways to show off their enormous wealth. Chinese auction houses seem to have an endless supply of antiquites, but where does it all come from? I can believe that there are some valuable antiquities in private hands that have somehow survived the ravages of the 20th century, but I have difficulty believing that any private citizen of China just happens to have a sample of Emperor Huizong's calligraphy or a Tang dynasty copy of Wang Xizhi's calligraphy just lying around. 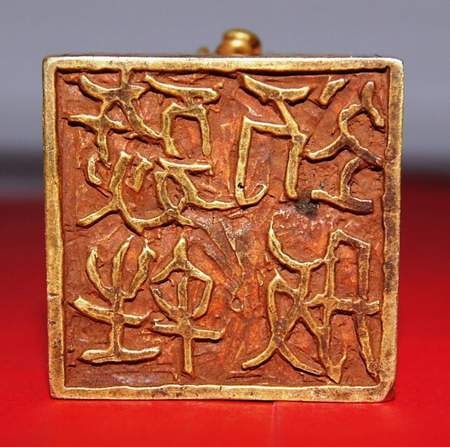 Although some of the antiquities on the market may be heirlooms that luckily managed to survive the Cultural Revolution, and a proportion must be recent, legitimate finds by peasants working their fields, such as a unique bronze Tangut chess piece, there must be other sources involved. In recent years thieves have gone to extreme lengths to steal treasure and artefacts from archaeological sites and ancient monuments, including digging a tunnel into a Liao Dynasty pagoda and even blowing up a Western Xia pagoda. Especially during the 1990s, grave-robbing and looting of archaeological sites was an enormous problem, and unfortunately it remains an unstoppable cancer. So there are undoubtedly genuine antiquities being dug out of the ground illegally and by nefarious means, but how many of these end up at Chinese auction houses is a matter of debate. It is likely that most of the illegally dug up antiquities are sold privately or smuggled out of China for sale to dealers or private collectors. The likely explanation is that much of the antiquities for sale in China are in fact fake. Although some have expressed doubts about chinese auction houses, in my opinion the full scale of the problem is relatively under-reported, and within China there is a tendency to uncritically accept as genuine almost everything that comes along (no provenance ever given, no awkward questions ever asked), despite the fact that everyone knows that faking antiquities is a huge underground business in China. The history of faking Khitan-inscribed artefacts goes back a long way, in fact all the way back to the advent of the study of the newly-recognised Khitan scripts in the 1920s and 1930s. 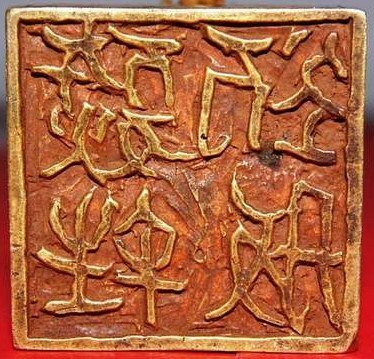 The most famous example of a fake Khitan inscription is a brick with a Khitan small script inscription that was reportedly found at the Jing'an Temple in the Liao Middle Capital, and published as genuine in 1936. 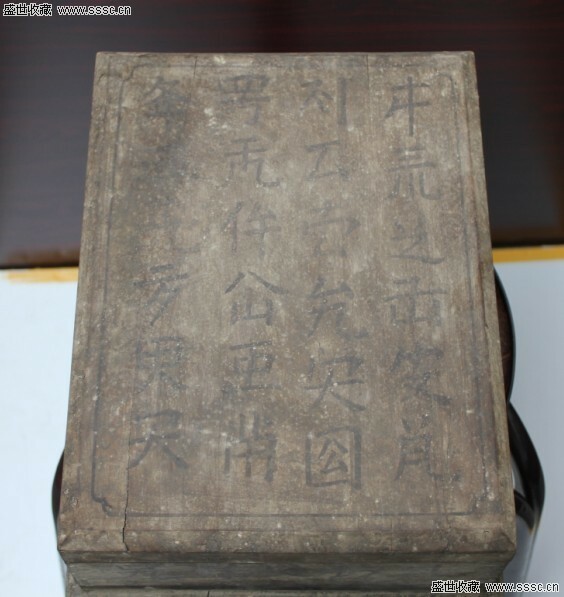 In fact the inscription was a forgery made by Xing Yuren 邢玉人, a stone mason and antiquities dealer, who copied Khitan text published by Luo Fucheng 羅福成 onto an old brick he had taken from the city wall at Shenyang. He then made money by making and selling rubbings of the brick inscription. 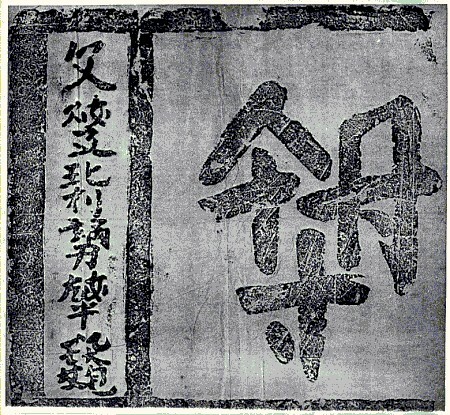 Although Yamashita Taizō 山下泰藏 of the Manchukuo Museum uncovered the deception, and broke up the brick and confiscated the unsold rubbings, the fact that the published inscription was a forgery was not widely known until the story was told by Liu Fengzhu 劉鳳翥 in 1979 (see Minzu Yanjiu 民族研究 1979.1:4, 8). Although the main focus of Khitan forgers has been on the portable antiquities market, in particular coins, most recently there has been controversy over the authenticity of some stone epitaphs studied by Khitanologists. Liu Fengzhu claimed in 2011 that two Khitan small script epitaphs in the collection of the Museum of the University of Inner Mongolia that were first published in 2010 by Juha Janhunen and Wu Yingzhe (New Materials on the Khitan Small Script) were forgeries, although this has been vigorously rejected by Janhunen (see J. Janhunen, "Some Thoughts Concerning the Authentication of Khitan Small Script Epitaphic Texts"; Тангуты в Центральной Азии (2012): 490–496). I have not had an opportunity to examine the two epitaphs that Liu Fengzhu doubts the aunthenticity of, but in my experience forged Khitan inscriptions are based on text copied from known genuine artefacts or epitaphs, and I do not believe these forgers have the skills and linguistic knowledge to create completely new epitaph inscriptions which are not copied from existing epitaphs but which are still plausible enough to fool professional Khitanologists. And even if they could achieve such a high level of understanding of the Khitan language and script that they could construct long passages of text that were designed to be semi-decipherable in a meaningful way by experts, what would be the point? The two epitaphs in question are in the possession of the University of Inner Mongolia, which I very much doubt paid a huge sum of money for them. Only scholars are interested in stone memorial slabs, and it is far easier and much more lucrative to fake small antiquities and coins made of gold for the ignorant collector market. 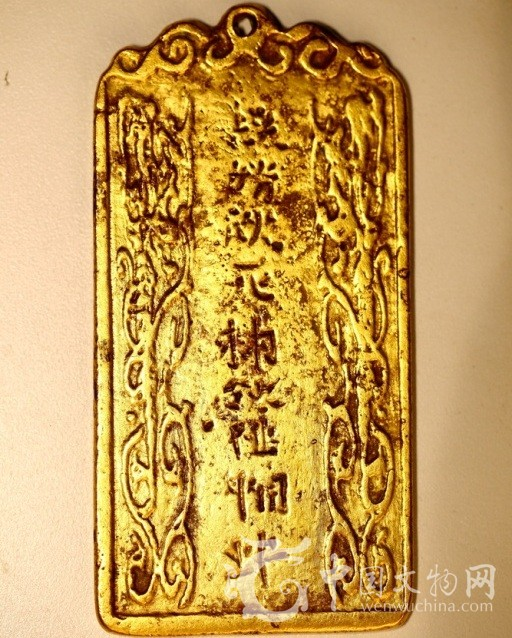 Over the last few years I have been amazed at the large number of Khitan-inscribed objects that can be found for sale on the internet or that are displayed on collectors' forums and blogs by proud collectors. The vast majority of this stuff is obviously fake, yet rarely if ever does anyone point out any doubts about their authenticity. Auction descriptions never mention a provenance for the unique and historically important (if they were genuine) items they are flogging, but this does not stop buyers spending upwards of half a million yuan (US$80,000) on individual items. 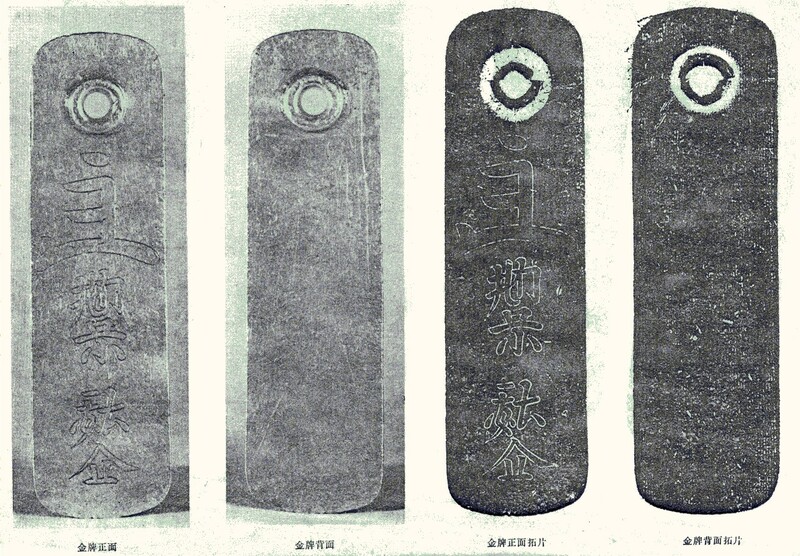 The number and variety of fake Khitan objects far exceeds those for objects with inscriptions in other contemporaneous national scripts (Tangut, Jurchen, Phags-pa). 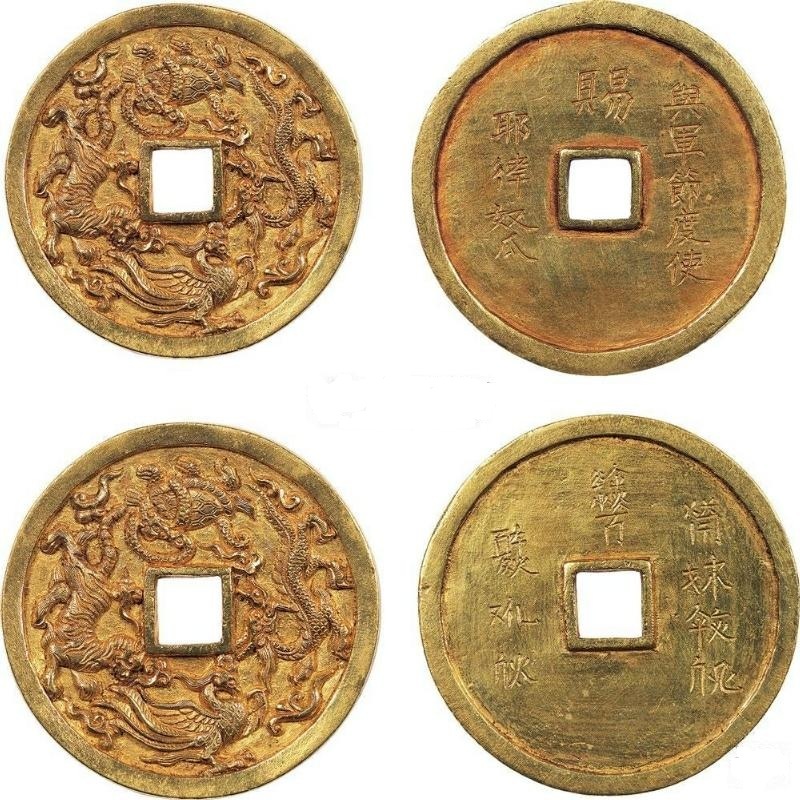 There are quite a few fake Phags-pa objects, especially coins and personal seals, but there are virtually no fake Jurchen-inscribed objects, and most of the Tangut-inscribed objects you can find on the internet are what I would classify as tourist souvenirs rather than commercial fakes. It is difficult to explain the popularity of both Khitan scripts for forgers, but I believe the boom in fake Khitan objects over the past few years is largely down to the untiring work of two self-proclaimed experts, Pei Yuanbo 裴元博 ("Expert on Liao and Jin history, and connoisseur of cultural relics") and Chen Chuanjiang 陈传江 ("Collector, and researcher into Khitan writing") who have written a number of books for collectors that promote dubious items (《契丹文珍稀钱币考释图说》（2011）, 《契丹文珍稀符牌考释图说》（2011）, 《契丹钱树鉴赏与投资》（2011）). 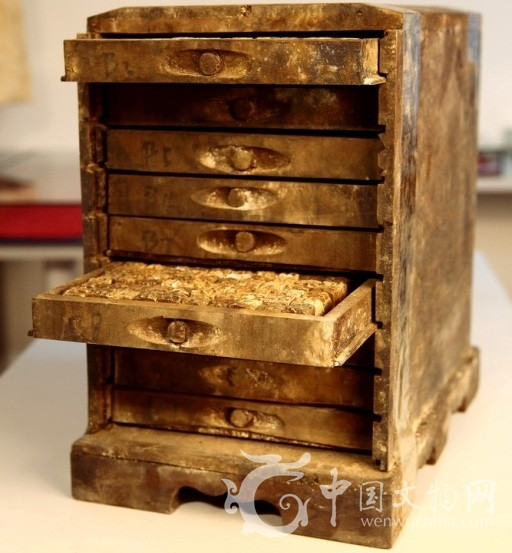 On 23 June 2010, Pei and Chen hosted a widely-reported symposium on Khitan culture in Beijing, at which many of the items discussed below were exhibited as genuine Khitan artefacts. Pei Yuanbo seems to have have taken in many people, and even Prof. Aisin-Gioro Ulhicun has endorsed some very suspicious Khitan coins provided by him (see 契丹大字「天神千万」考 page 55). 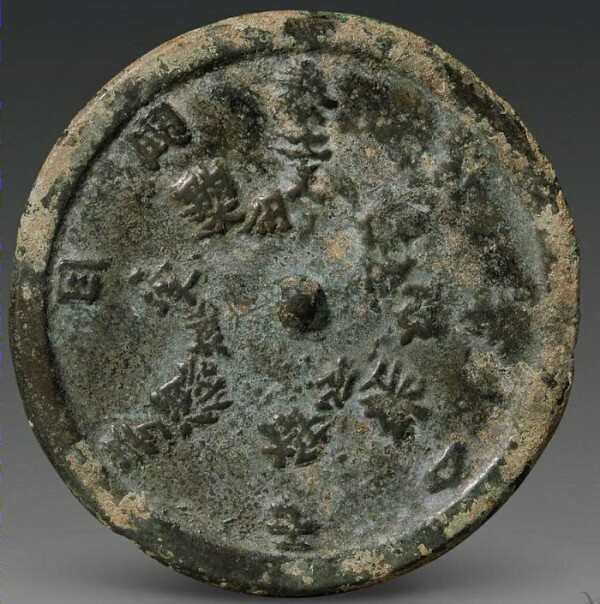 Only Prof. Heqiyetele 贺其叶勒图 (Director of the the Nationalities Museum of the University of Inner Mongolia) has publicly spoken out about fake Phags-pa inscribed paizi exhibited at Pei Yuanbo's 2010 symposium (much to Pei Yuanbo's chagrin, see here and here). 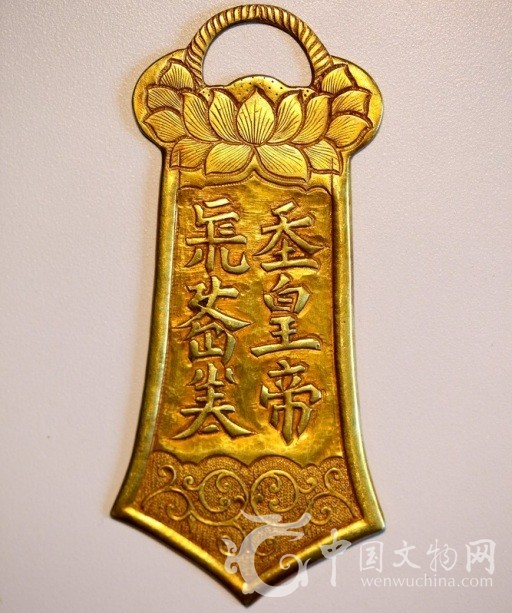 Ironically, and perhaps in order to bolster his reputation and trick people into believing that the items he exhibited are genuine, Pei Yuanbo has himself written an article in which he warns collectors to "Rub your eyes, don't fall prey to tricksters, be aware of fake Khitan-inscribed coins and charms" ! I can only advise my readers to follow these wise words as below I cast a critical eye over a small selection of Khitan-inscribed objects that I have come across on the internet. This is an extremely rare non-circulation ceremonial coin with an inscription comprising four Khitan large characters, interpreted as meaning "Heavenly Court Everything Successful" (Chinese 天朝萬順 tiān cháo wàn shùn) or "Heavenly Court Ten Thousand Years" (Chinese 天朝萬歲 tiān cháo wàn suì). 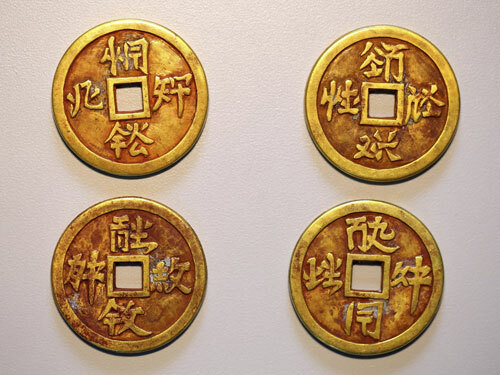 Bronze versions of this coin are held as the Capital Museum and at the Shanghai Museum, and a silver version with 8 Khitan characters scratched on the reverse was discovered at the site of the Liao Dynasty Upper Capital in 1977. The coin shown above was sold at auction for the equivalent of US$66,000 in 2006. It is quite an attractive looking coin, but the characters are a little thick and the 万 character is wonky, and at least one expert doubts its authenticity. A small gold version of the "Tianchao Wanshun" coin, with the inscription reading anticlockwise, was reportedly found at Hexigten Banner in Inner Mongolia during the 1990s (Kaogu 1994.2: 179). The poor calligraphy on the coin shown above matches that of the gold coin found at Hexigten, and maybe it is that very coin, but if it is it is an altogether unconvincing piece, and I certainly wouldn't want to pay half a million yuan for it. But don't worry, if you don't have half a million yuan to spare there seem to be no shortage of gold "Tianchao Wanshun" coins on the market. One internet collector boasts a collection of five different versions of this gold coin, and in reference to one these coins he notes: "1. Is it too new? After collecting this coin I tied a red string through it and hung it from my waist for half a year, and lots of dirt was rubbed off. 2. The "court" character seems to have a broken stroke. Actually this happened when I took it out to show to a friend, and he bit it to see if it was gold or not; since then I have never shown it to anybody around mealtime." Good thing he can easily buy a replacement. Gold is what it is all about for the modern nouveau riche collector. If this pair of coins, one with a Chinese inscription and one with a Khitan small script inscription, were genuine they would be a national treasure of great importance. However, one glance at the awful Khitan small script calligraphy on the bottom coin is enough to dispel any illusions. The first indication that these coins are fakes is the Chinese inscription on the top coin, which incorrectly has 賜與軍節度使耶律奴瓜 "Given to the military commissioner Yelü Nugua" instead of 賜興軍節度使耶律奴瓜 "Given to the Xingjun military commissioner Yelü Nugua", with the character 興 xīng in place of the similar character 與 yǔ. The proof that 與 yǔ is a mistake is that the History of the Liao records that Yelü Nugua 耶律奴瓜, (also called Yelü Yanning 耶律延寧) was promoted to the position of Liao Xingjun Military Commissioner (遼興軍節度使) in the 26th year of the Tonghe era (1008) — the forger of this coin must have misread 興軍 as 與軍. 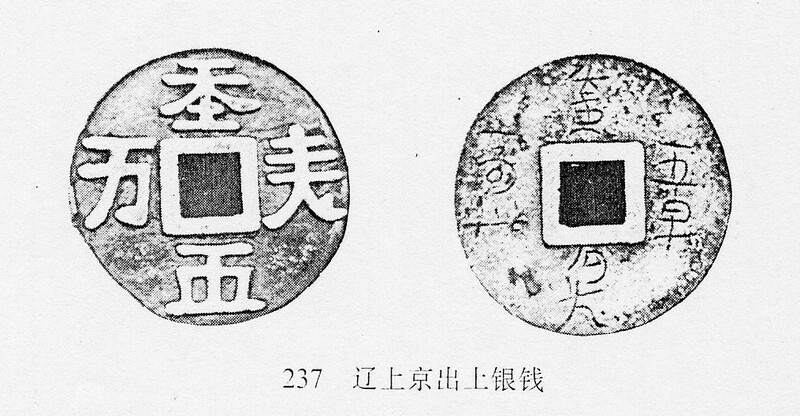 The Khitan inscription also betrays the coin as a fake. The inscription above the central hole of the Khitan coin reads t.em.le.ge.ei "to bestow a title", corresponding to the the character cì 賜 "to give" on the Chinese coin, but with some miswritten character forms that would not be expected in a genuine inscription. The inscription on the right reads x.i.iŋ ź.en(?) z.ie du sh, transliterating the Chinese title "Xingjun Military Commissioner" 興軍節度使 (xīng jūn jiē dù shǐ), but with the wrong 2nd polygram transliterating Chinese jūn 軍 (it should be written as g.ün), and the last two characters written together as a single polygram when they should be written separately. The inscription on the left, corresponding to the Chinese name Yelü Nugua, reads ei.ra.u.ud mo.ri k.uŋ, meaning "Lord of the Yelü tribal unit" (cf. ei.ra.u.ud mo.ri "Yelü tribal unit" on line 5 of the Yelü Dilie epitaph [Kane 2009 p.193]). The individual Khitan small script polygrams around each coin are readable, but they do not seem to make much sense when put together. 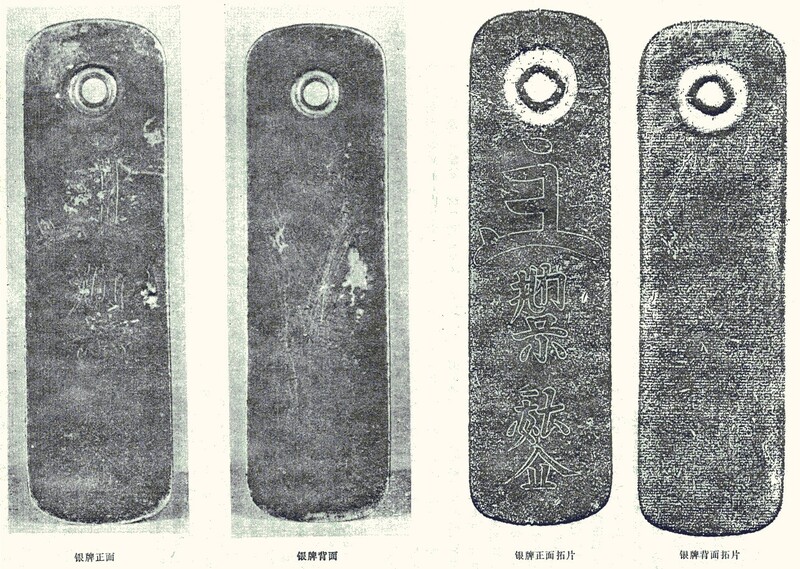 Most of the polygrams on the coins are used in epitaph inscriptions to transliterate Chinese characters (as might be expected), for example l.iŋ for Chinese líng 陵 "mausoleum" (top of 1st coin), sh for Chinese shǐ 使 "envoy" (right of 1st coin), d.ei for Chinese dé 德 "virtue" (top of 2nd coin), g.em for Chinese jiǎn 檢 "to inspect" (right of 2nd coin), da.ai for Chinese dài 大 "great" (right of 3rd coin), iŋ for Chinese yīng 應 "response" (bottom of 3rd coin), cau.uŋ for Chinese chóng 崇 "lofty" (top of 4th coin), w.u for Chinese wǔ 武 "martial" (right of 4th coin). On the other hand, some of the polygrams are only found in epigraphic inscriptions as parts of Khitan words or names, for example ei.au (top of 3rd coin), l.ha (left of 2nd coin), qid.ul (?) (right of 1st coin), and I would not expect these to be part of an inscription largely comprising transliterations of Chinese characters. The polygram a.ai (left of 4th coin) is the common Khitan copula "being", but is particularly out of place here. My impression is that whoever created the inscriptions on these coins did so by deliberately picking short polygrams (only comprising one or two phonogram components), for their length rather than their meaning, from published epitaph inscriptions. This silver paizi was for sale at the Panjiayuan Antique Market in Beijing. Three paizi with the exactly the same inscription have been found in the past (a pair of gold and silver paizi found at Chengde, Hebei in 1972; and a single silver paizi found at Dehui, Jilin in 1980). 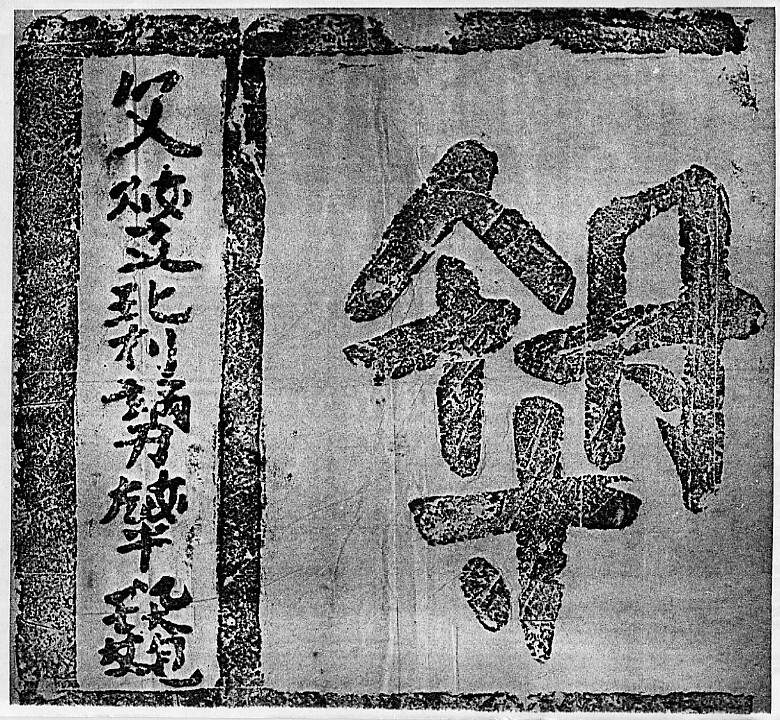 At first glance the inscription looks like the Khitan small script, but the characters are not the same, and Aisin Gioro Ulhicun has plausibly argued that it is in fact the sole surviving example of the Jurchen small script. 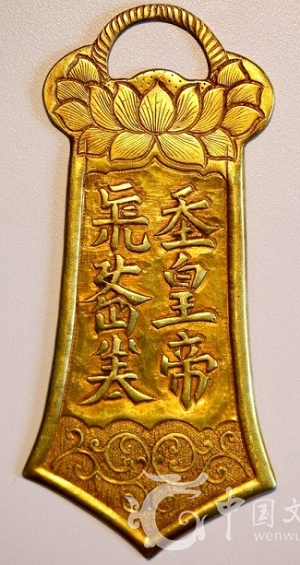 As for the example shown above, it's calligraphy is flat and unconvincing compared to the authentic examples found at Chengde, and it is undoubtedly a rather poor copy of a museum piece. 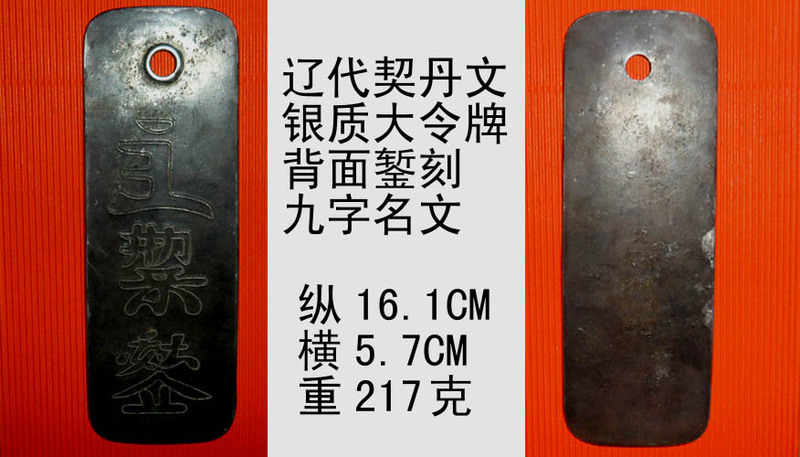 Another shiny product of the Pei Yuanbo and Chen Chuanjiang factory, but this time with a Khitan small script inscription. The last two polygrams read l.iŋ p.ai, transliterating Chinese lìng pái 令牌 "command tally", and the preceding text appears to be a transliteration of a Chinese title. The piece does not look authentic, and it is seems improbable that a military command tally would have been made from gold. 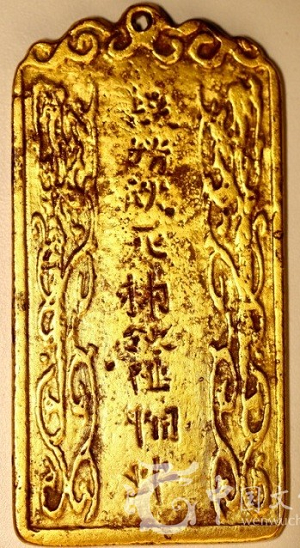 You can see images of this impressive pair of gold seals, both purportedly belonging to Yelü Zongde, one with a lion handle and the other with a dragon handle, half way down this page, where they are described as "a pair of typical Khitan name and title official seals". Back in reality, the calligraphy is so bad, and the calligraphic style and seal text so unlike anything seen on genuine Khitan-script official seals that I am tempted to call these seals fantasies rather than forgeries. 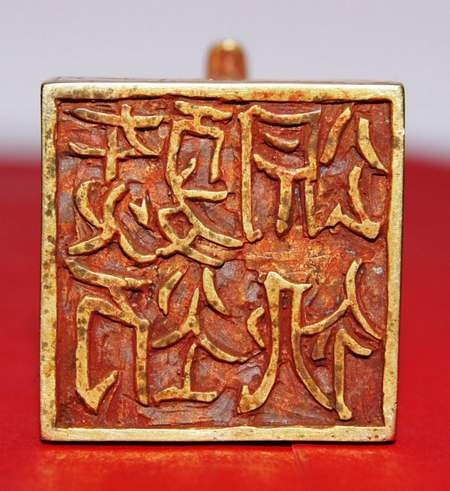 Genuine Khitan seals are inscribed using the Khitan Large Script, but these are written in the Khitan Small Script. 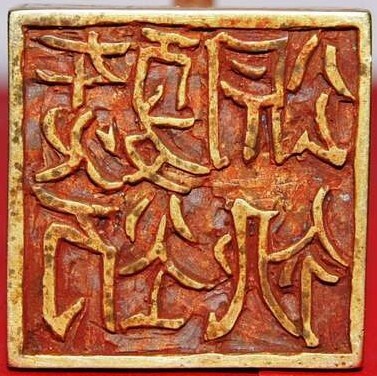 Genuine Khitan seals are inscribed using "seal script" calligraphy, but these are written in ordinary Khitan Small Script characters. Genuine Khitan seals almost always end with the words "seal of ...", but these do not. Everything about them screams out "Fake!". I'm tempted to say that this is a genuine piece. If it is a modern fake they really made the effort to make it appear as poor condition as possible, and the calligraphy as illegible as possible. But from what I can see, the Khitan small script calligraphy doesn't look too bad, and from the layout of the characters it appears to be an Eight Trigrams mirror. Saving the best for the last! Someone has been churning out half-baked clay type matrices for the Khitan small and large scripts. Very innovative, but utterly unbelievable. 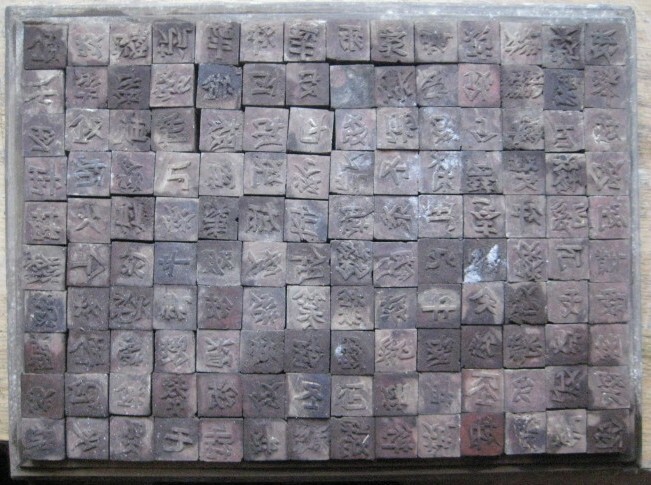 Whilst we know that wooden and clay movable type was used for printing Tangut books (e.g. 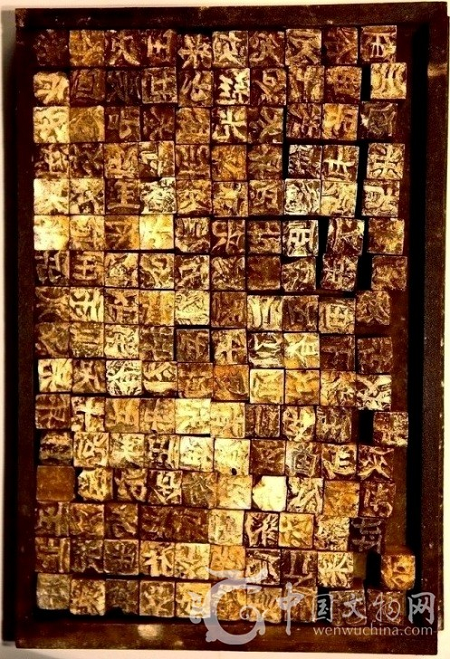 the Auspicious Tantra of All-Reaching Union which is is thought to be the earliest extant example of a book printed using wooden movable type), there is not a single extant example of a Khitan printed book or even a single fragment of a page of printed text in Khitan large or small script, and the discovery of genuine Khitan type matrices would be earth-shatteringly important to Khitanologists. 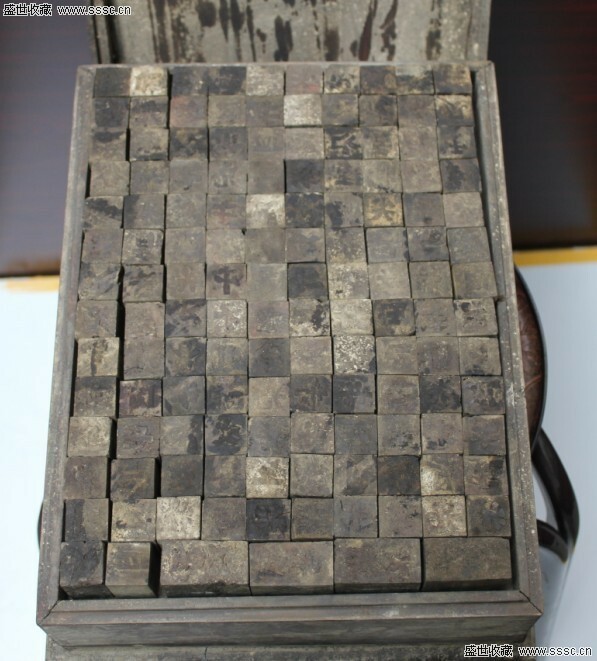 This set of Khitan large script type matrices, complete with a little wooden chest of drawers for storage, was exhibited at Pei Yuanbo's 2010 exhibition. 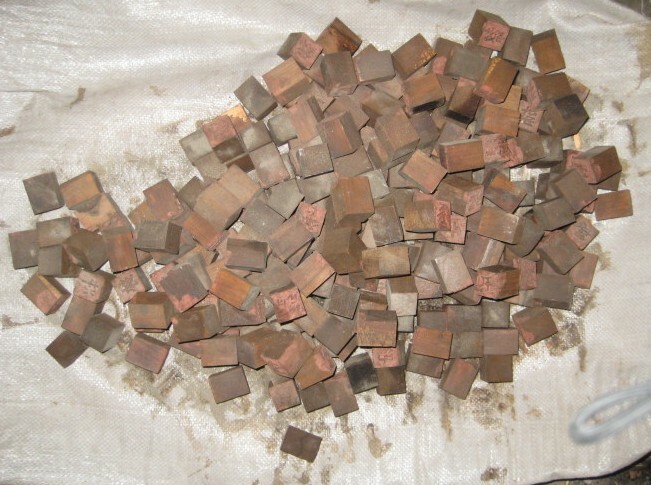 All I can say is many congratulations to Pei Yuanbo for inventing a time travel machine so that he could travel back in time to the reign of Emperor Shengzong of Liao (982–1031) in order to pick up this brand new set of movable type matrices that were made at least ten years before movable type technology was invented by Bi Sheng over in the backwards Song empire.